Are you looking for an integrated freight management solution for NetSuite? SmartFreight® provides multi-carrier transport management systems. The team at BM Online has completed a substantial upgrade to our SmartFreight® integration for NetSuite. This freight management solution for NetSuite provides generic multi-carrier freight management – a single solution across multiple freight companies. Image carrier independence, with least cost routing, full carrier compliance– with a bi-directional interface to / from NetSuite. The user creates the new delivery or fulfilment in NetSuite and marks it as “Ready for SmartFreight”. 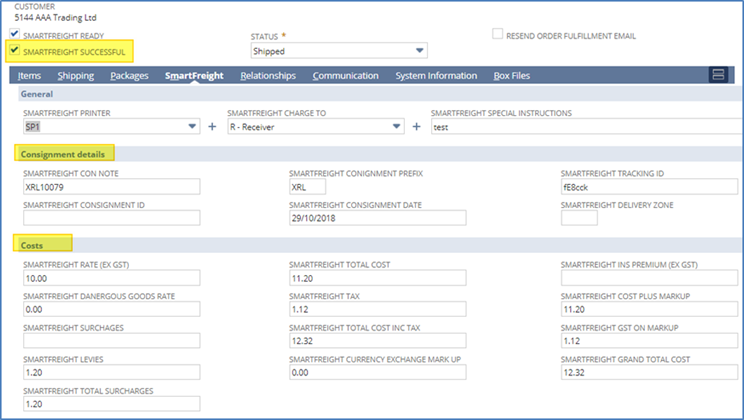 This triggers the integration with SmartFreight to generate the connote based on the defaults as defined in the system. Data is synced from the SmartFreight system to the NetSuite – including the tracking number and freight costs. Sender account details can be specified at a warehouse/Location level. The receiver IFS account number will be determined by a combination of the base documents in NetSuite (customer) and the selected freight carrier. The sender address details will default to the address found on the warehouse or location record on the fulfillment. User can set defaults for the size and dimensions of the package items. These get defaulted on the consignment line level when the package item is selected on the Fulfillment. The NetSuite / IFS SmartFreight® integration operates across a NetSuite One multi-company environment. The association of a freight carrier/service or range of carries/services to a customer in NetSuite. The receiver address will be obtained from the address specified by the user on the shipping tab of the Item Fulfilment document in NetSuite which usually defaults from the Sales Order/Customer. Delivery options can be defaulted from the shipping type specified on the base document. If any defaults are found, they will be selected when the screen opens for the first time. As detailed above, the team at BM Online has invested a great deal of energy developing this NetSuite / SmartFreight® solution . If you are a NetSuite user looking for a multi-carrier, freight management solution then SmartFreight® integration from the team at BM Online will provide the answers that you are looking for.